The Workflows report provides a list of all workflows along with their templates, bindings and configuration. Template: Displays the name of the template assigned to this workflow instance. Users: Displays the name of the user(s) or group(s) bound to the workflow. What: Displays the action that is associated to this workflow instance that requires approval to access. When: Displays the enabled time selector(s) that is bound to this workflow instance. 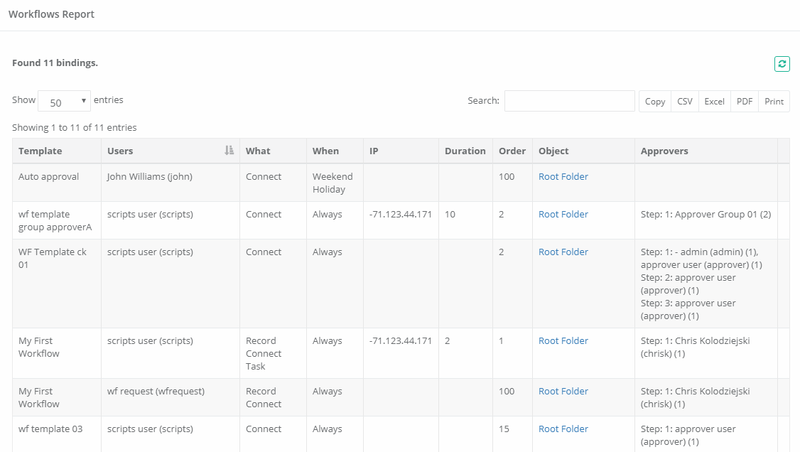 IP: Displays the IP filter that is bound to this workflow instance. Duration: Displays the duration value that is bound to this workflow instance. Order: Displays the order value that is bound to this workflow instance. Object: Displays the object (and provides a link to open it) that is assigned this workflow instance. Approvers: Displays the list of approvers in each step that are assigned to either Approve or Reject the access request.